Since 2003, the city of Vienna has offered both residents and tourists a free way to travel in the city by bike. Progressive hiring rates, mandatory registration with name and address and upkeep of bike systems are seen as the strongest factors of success with Citybike Wien. Since 2003, the city of Vienna has offered both residents and tourists a free way to travel in the city by bike. For an initial registration fee of 1 Euro with a credit card, trips under an hour are free - one only needs to re-dock the bike at the loading site and wait 15 minutes for an additional hour. Any travel exceeding one hour is charged approx. 1 Euro per hour. The affordability of the system and first hour free aims to prevent users to borrow bikes for over an hour. Statistics show that 97% of bike users hire biks in Vienna for under an hour. As of October 2011, 83 bike stations exist across Vienna. 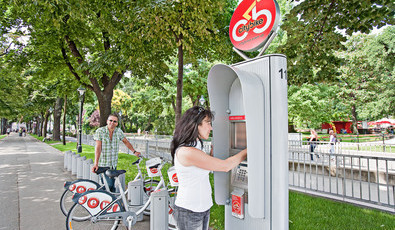 By 2015, Citybikes Wien plans to install a total of 120 systems. Further, many bike stations lie either at U-Bahn (subway) stations, tram, bus or city-train stops, allowing users to easily integrate other forms of public transportation with Citybike use. Citybike Wien is a project of Gewista Werbeges.m.b.H. together with the city of Vienna. Sponsors include Nokia, One, Vöslauer, the Raiffeisen Landesbank of Lower Austria help to fund the bike service, using the bikes as product advertisement. Therefore, no financial suppport is needed from the City of Vienna, making this a tax-payer free project. To use Citybike Wien services, one-time registration is required – via the Internet or directly on the Citybike terminal. Registration is possible by using a MAESTRO card (cash-dispensing card) issued by an Austrian bank, a credit card from VISA , MasterCard, or JCB Creditcard. Following your initial registration, one can hire one bike per card immediately. One also has the option to order a Citybike Card. Then any open fees will simply be paid via automatic debit transfer from an Austrian bank account. Tourists just visiting Vienna can hire a Citybike Tourist Card for every bike. The fee for using the Citybike Tourist Card is € 2.00 per calendar day. Bike terminals are equipped with a touch screen and offer a clear arranged service, e.g. a station map. Maps show up-to-date information on how full the various city stations are, allowing users to prepare where to return their bikes after traveling. Stations tend to lie within a kilometer of each other, allowing easy access to neighboring stations for bike return. Problems are communicated directly to the Citybike Vienna team through the station management. Currently there are 320.000 registered users, dating from initial creation in 2003. These numbers continue to rise and represent over 500.000 trips per year. In Vienna, studies show that 50% of the driving lengths are about 5 km and could be therefore done by bike. Therefore, Citybikes can be seen as both a functional and leisure activity. The progressive hiring rates, including the first-hour free travel, is seen as one of the project's main successes. Due to this, hiring durations are kept low and availability of the bikes is kept high, because the shorter the rides the more rentals can be done within any given timeset. Mandatory registration with name and address is also helped to make the project successful, essentially transferring responsibility of the bike to the user, with the effect that Citybike Wien has no problems with vandalism or theft. Bikes are generally in great condition and the presence of separated bike lanes throughout the city allows riders to quickly get from one station to the other. Station maps are available in both paper format and on the 80+ station machines, allowing users to quickly and easily find loading docks. Many use the bikes to travel with friends who own bikes, allowing bike owners to travel throughout the city with friends who do not own a bike. More information can be found at www.citybikewien.at (in German and English).